No, don't eat it! Just leave it as a display. Besides that's way too much sweet for a little girl. hahaha... I think you're not supposed to eat gifts like that. Although maybe it was purposely created to be smashed into smaller pieces. "How come his face looks that way?" @Ryhen - My daughter would then ask "what's murder?" Her uncle told her because she always make mean faces so Santa is not happy. if the thing is solid, not going to be easy to cut it up into pieces. Better to leave it as a decoration. My first time here. Been seeing you around my friends' blog. Love to read your comments. My name is Shakira and I would be so honoured if you would visit my blogs. @A-Mara - He looks scary as a diplay figure. My daughter sometimes would turn him the other way around so she won't see his face. @Dora - You know, he does look frustrated more than mean. Hmmm...not a good expression for a Santa! Hmmm....I hate to admit it but he does look somewhat "mean". Maybe you can all share the chocolate, or melt it for a nice chocolate fondue with fruits! @Shakira - thanks for stopping by! sure I'll visit your blog. look forward to reading them! 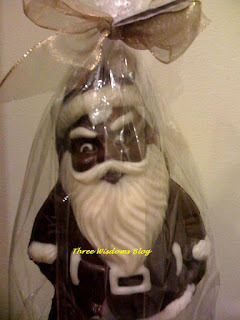 @Mei - lol..yeh fierce Santa! You know what? 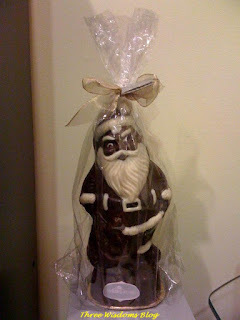 The Santa did not look too appetizing to me, haha!